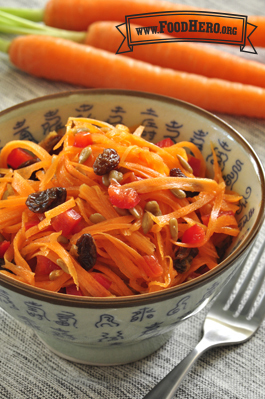 Combine carrots, peppers, raisins and sunflower seeds in a bowl. Combine orange juice, vegetable oil, soy sauce, ground ginger, garlic powder and honey or sugar in a jar. Cover and shake to blend. Add the oriental salad dressing or your favorite salad dressing. Stir to blend. Refrigerate for a few hours to blend flavors. 4 Comments for "Asian Carrot Salad"
Really wish i pay more atttenion to the Photo, I used the finest grate i had and kind of have asian carrot mush. It is still tasty though. I also did not have a Jar but i did have a protien shake mixer. Looking foward to leftover for lunch. I made this for my family this weekend and my dad asked me why I didn't make more. He loved it and it looks like everyone else did too. Very tasty recipe and easy to prepare with ingredients we almost always have on hand. This recipe tastes even better the next day! When I make it again, I think I will double the recipe so I have leftovers.